Michael Connelly is one of the most prolific legal mystery authors, best known for his Harry Bosch Universe, which includes not only the Harry Bosch series but also the Mickey Haller series, and the Jack McEvoy, Terry McCaleb, and Renee Ballard series. While each series is standalone from the rest, they all have Harry Bosch involved somehow, and many of the characters from one series also feature in others. Here are the Michael Connelly books in order for his vast Harry Bosch Universe, which will be split into the separate series based on its main character. If you want to read, however, the Harry Bosch Universe in chronological order regardless of the separate series, then follow the corresponding list in the brackets below. Michael Connelly was born in 1956 in Philadelphia, PA, where he remained until the age of 12 when he moved with his family to Florida, which is where he grew up. After finishing high school, he enrolled at the University of Florida where he truly discovered his love of books after reading Raymond Chandler novels. This is when he decided that writing mystery books was what he wanted to pursue, so he went with a major in journalism, along with a minor in creative writing. He graduated from college in 1980, following which he started working at various newspapers in Daytona Beach and Fort Lauderdale, Florida as a journalist, working mostly the crime beat. During the cocaine wars, Michael wrote pieces around investigations of crimes committed, and following a major airplane crash of Delta Flight 131 in 1985, he and other two journalists investigated survivors, and once their work was done, 1986 they wrote a story for the Orlando Sun-Sentinel surrounding the crash and its survivors, which short-listed for the Pulitzer Prize for feature writing. This very piece skyrocketed Michael Connelly’s journalism career, allowing him to get a job with the Los Angeles Times as a crime reporter at around the age of 30 in 1987. Incidentally, Los Angeles is the home of Raymond Chandler, the very classic author who started Michael Connelly on his path to becoming a prolific author. Not only that but when Michael Connelly moved to LA, he moved to the very apartment where Philip Marlowe (as played by Elliot Gould) rented in the Altman movie. This very apartment was where Michael Connelly wrote The Lincoln Lawyer, the first in the Mickey Haller series. Michael Connelly remained at the crime beat for a good while since he knew that learning about the very world he was writing about was important not only in his research but also in getting the people, setting, and places with the right tone and inflection. Some three years after getting the job at the LA Times, he started working on his debut novel, which would become The Black Echo, the first book to feature our beloved Harry Bosch. The book was published in January 1992, and with this, Michael’s career as a book author began after the novel won an Edgar Award for Best First Novel, and readers and critics got a glimpse at this new work. There were a total of four Harry Bosch books before Michael Connelly wrote The Poet, the first in the new Jack McEvoy series, who – just like Michael – was a newspaper reporter. After that, The Trunk Music followed as another Harry Bosch book, and then, a new Michael Connelly book called Blood Work emerged as the first in a new series titled Terry McCaleb. This latest book became a popular movie featuring Clint Eastwood in 2002. An interesting tidbit Michael Connelly revealed in an interview was that he found the location where Harry Bosch would live while Michael was investigating a murder during his time as a reporter. Michael Connelly became a full-time writer around 2006 when he stopped working as a reporter to focus on crafting his novels. A big life goal for him was to get away from his day job, and he finally did it. Still, he feels just like a journalist when he tells the stories of people featuring in his books. The screen rights for a Harry Bosch movie or TV show were stuck with Paramount between 1995 and 2010, during which time the author was fighting tooth and nail to release the screen rights back to him since a real development for Harry Bosch was not in sight. Once he got back the rights to his character through the legal battle, he gave it to Amazon Studios and Fabrik Entertainment, who created the now popular TV series titled simply Bosch with Titus Welliver as the main character. Michael Connelly must have been the very first author whose books were also filmed at real police stations, this case at three LA ones. Although most of the Michael Connelly books focus on male main characters, his latest series is about a female protagonist, Renee Ballard who is inspired by stories from Mitzi Roberts, a female homicide detective with the LAPD who has also consulted on the Bosch TV show. Both Mitzi and Renee have worked the night shift in Hollywood. Renee Ballard and Harry Bosch do share some common traits, both being somewhat outsiders in their own departments, both sort of loners. Both are hard-working cops who are fully committed to justice and won’t look away just to make things easier for themselves. Also, since Harry Bosch is already retired from the LAPD, Renee keeps this particular police station alive in the Michael Connelly novels. In the meantime, Harry Bosch is now freelancing to keep himself somewhat involved in police work. 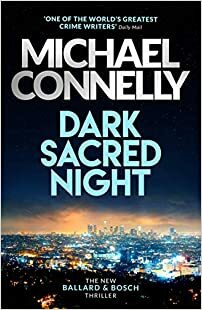 As is usual in the Michael Connelly books, the main characters tend to cross paths between series, all gravitating within what us, readers, like to call the Harry Bosch Universe. Over the years, Michael Connelly has received numerous awards for his internationally acclaimed books. He was awarded or received several times the Dilys Awards, the Anthony Awards, the Macavity Awards, the Dagger Awards, the Anthony Awards, the Edgar Awards, the Shamus Awards, and the Barry Awards – all which are pretty much the biggest awards authors can receive for this best books. Harry Hieronymous Bosch got his name from a famous 15th Century Dutch painter. In many ways, is the opposite of his creator, Michael Connelly. While Michael comes from a large family, Harry Bosch is an orphan, with his mom (a prostitute in Hollywood) having been murdered while he was still young at the age of 11. He then was sent to various orphanages, from where he ran away at the age of 14 when he lived on the beach for a while during which time he learned to surf (the author has also surfed in his youth, so this was a nice touch to add to Harry Bosch’s traits). He attended both high school and college, but he didn’t finish either. He did get a GED later though. Harry is the half-brother of Mickey Haller (both come from the same father), who got his own book series as well. Harry is a loner and prefers to usually work alone as a one-army-man. He has issues with authority and anger issues, most probably due to his traumatic history couples with his also traumatic experiences in Viet Nam (he was injured a few times and got the Purple Heart as a result). Not surprisingly, he has symptoms of mostly untreated PTSD. As a consequence he is not horrified by violence or crime, which he considers a sad but normal part of life. This is not to say that he doesn’t show compassion for the victims he comes across. That’s why he’s doing his best to solve all the murder cases that come across his desk – and even some that were either taken away from him or simply are not his cases at all. As an impatient person, he does bend the rule at times to get his results faster. He has many skills, some shadier than others, which he uses to help in solving his cases. For example, he can pick locks, which he does all too often. He was married once, but he always ends up single – maybe due to the job, his relationships are always quite short. He is a smoker, and he has a daughter, Madeline, who wants to be a cop as well (so hopefully in a few years we’ll see a new series featuring Bosch’s daughter as a new LAPD detective). While it seems like an impossibility, there are still every year newcomers to the world of this author. So reading the Michael Connelly books in order should invariably start with Harry Bosch. Of course, you could always start with the first Renee Ballard book, or with the first Mickey Haller book, or even with the first Jack McEvoy or Terry McCaleb book. However, soon you will run into the issue of meeting Harry Bosch and not knowing a darn thing about him, and that would be a pity. Harry Bosch is much more than a person. He is an entire world worth discovering, so reading the Harry Bosch books as part of the Universe – while not strictly a must – are still recommended to understand this deep world the author has created for his readers. And once you start reading the books, you will be engrossed in the Los Angeles world’s stories for a long time to come since Michael Connelly has written so far well over 30 books. The Michael Connelly Harry Bosch books have earned so much praise that an entire novella could be written by including them all. So here are a few more interesting ones.